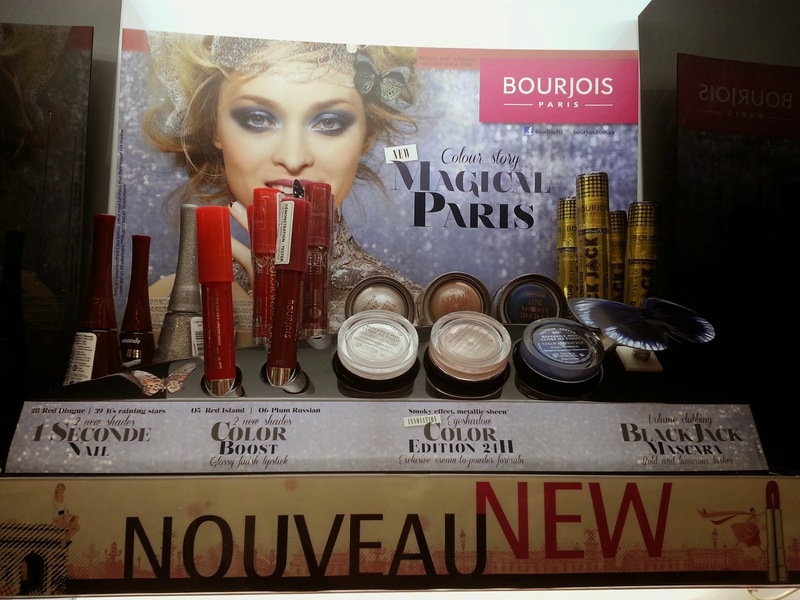 Last week I popped into Priceline on my lunch break and saw a new stand from Bourjois. It was so new that there weren't any prices there!! In the range they had some nail polish, lip crayons, cream eyeshadows and a new mascara. I ended picking 3 products from the new range. They had testers out, and I adored the lip products so I picked up both of them as well as 1 eyeshadow. There are 6 shades available in the UK of the Colour Edition 24H Eyeshadow, but only 3 available here in Australia. We have the whitish silver, a pale pink champagne and a dark blue. See the 6 colours here. They all have a metallic sheen. Not being familiar with its performance I just picked up the pink one as I thought I would reach for this more than the other 2 colours. . The packaging is very similar to the Maybelline Colour Tattoo's (black lid, clear glass top). These are very easy to apply onto your eyelid. I prefer to apply it with my beloved Models Prefer Cream Shadow Brush, which I've blogged about here before. It's really easy to use with the brush. It's a cream formula that's supposed to turn into a powder. I've found depending on the light, it sometimes seems more pink or has shades of a light brown. While I love the colour, the formula has been a let down. While it was easy to apply and seemed to "set" easily (although not in powder form) I found it did wear within 4-6 hours and it did crease, so I can safely say that it doesn't live up to the 24hr claim. I'm yet to try it out with a primer or to set it with a powder eyeshadow, but honestly at $20 I wouldn't expect that I would need to. Because of that I won't be picking up the other colours, even though they are beautiful. On a positive note, I did like the feeling of the eyeshadow. It didn't feel wet or heavy and was very easy to apply. I'll be posting about the lip products in a separate post. Have you tried these? Do you think $20 for a single cream eyeshadow is too much? Hahahaha. I wish I had bought it when Priceline had 40% off. It wouldn't have disappointed me as much. I'd be pissed if I spent $20 on a product that did that, thanks for letting us know. I will be avoiding! Glad I could help. It's nice to hear negative things too sometimes. That is a shame especially considering the price! I would be annoyed as well. I'm excited to see your thoughts on the lip products. I have two of the original shades but I honestly have never worn them haha whoops! Wow - $20 is very expensive! Personally, I won't be picking any up especially because the formula isn't anything spectacular. It is!!! I would have probably put it back if I knew the price before buying it. It does. I guess it's hard to make a unique lip crayon :) All brands crayons look the same. Such a shame! I've been waiting for these to be released here in Australia, and I'm really disappointed that they didn't release the prune colour, it looked gorgeous, and it was the only one I wanted haha. Oh well, I hear Maybelline is good? Ohhh I hate when that happens. Maybelline are fantastic. The colour range is great, the quality is fantastic and the price is good too.